The last 4.5 years I’ve learned so much about curly hair! Our daughter was born with a full head of wavy hair and slowly as she got older the curls grew tighter and tighter. I have wavy hair myself, but I never took care of biracial hair before. So I did a lot of internet research, scanning Facebook group boards and talking to friends who had curly haired kids! Though I strive to continue learning, I finally feel confident in our kid’s curly hair routine. Now that our daughter is older her hair gets very knotty and tangled if I let it go too long without treatment. 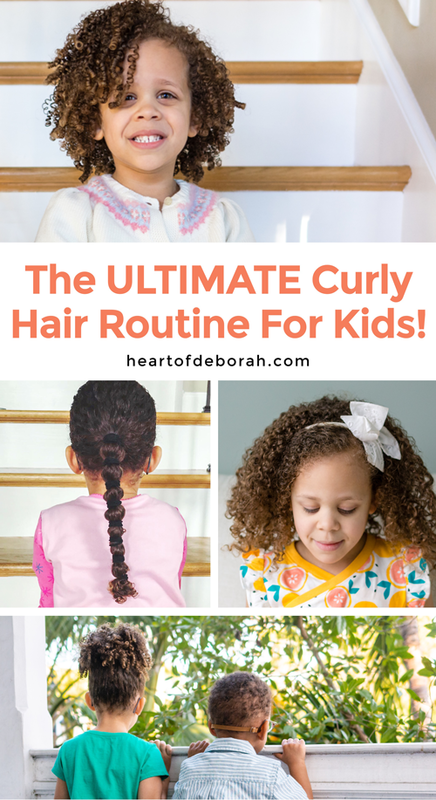 So today I am sharing my favorite hair care products for naturally curly hair and our kid’s curly hair routine. Also be sure to check out our 7 curly hair tips for more information. This post contains some affiliate links for products we use and love! 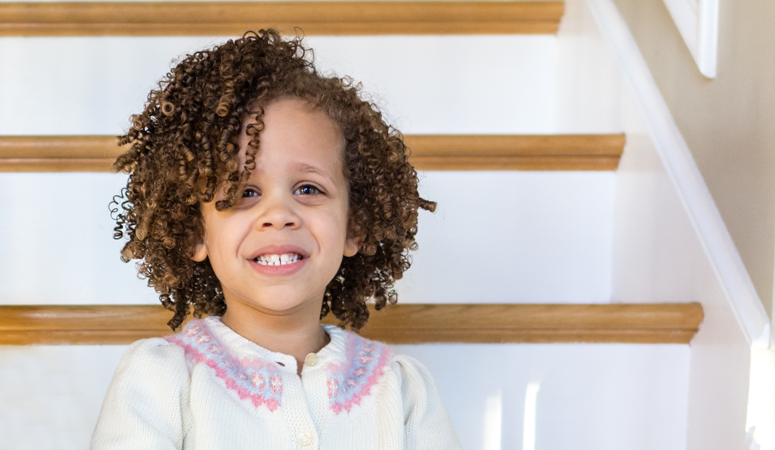 Step 1 Shampoo: When our daughter was younger we used shampoo once a week for her curls. Then we discovered DevaCurl’s No Poo. You may be thinking, what you don’t shampoo her hair!? I know this sounds crazy, but curly hair loves moisture and shampoo often leaves hair very dehydrated. No poo cleanses the curls without taking away any of the natural oils. Once a month we use this buildup buster to thoroughly cleanse the hair. Step 1.5 Mask: About once a week I use a deep conditioning mask in our daughter’s hair. We invested in a shower head that detaches so I can easily rinse her hair while she takes a bath. After I use the no poo to cleanse I add one of our favorite masks: Deep Sea Repair (Strengthening Mask), Melt into Moisture (Conditioning Mask) or Intensive Hydration Treatment. I put a shower cap on her head and let her play for about 15 minutes before rinsing the mask out thoroughly. If her hair is super dry and needs extra moisture I do this before the bath and let it soak in her hair for at least 30 minutes. Step 2 Condition: We LOVE DevaCurl One Condition . It smells amazing, has safe ingredients and it conditions our daughter’s hair perfectly. 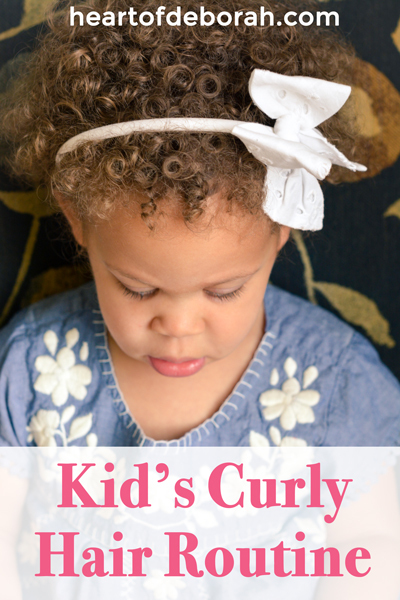 It’s not too heavy or greasy yet hydrates her curls. I use a very generous amount (think hand fulls) then wait 1-2 minutes before combing. Do not rinse out before you comb or brush! Step 3 Comb/Brush: Some people believe you should never brush curly hair. I definitely would never put a brush to our daughter’s hair when it is dry or without conditioner in it! But when she is taking a bath we use the wet brush or the denman brush to detangle. I can’t decide which brush is my favorite. To detangle section the hair and brush from bottom to top. Meaning you detangle at the end of the curl first then work your way to the root. We’ve also used a wide tooth comb or our fingers to get through the knots. Step 4 Leave in Conditioner: After I comb through Izzy’s hair I quickly rinse her roots. I purposefully leave some of the conditioner in her hair as a leave in conditioner. This is the first stop of the L.O.C. method (Leave in Conditioner, Oil, Cream). I’m honestly not sure who created this method or I’d give credit, but it seems to be all over natural curly hair websites. Step 5 Oil: After you get out of the bath and carefully towel dry the curly hair you can add oil. We’ve experimented with a few different oils for this step. I used to use coconut oil a lot when Izzy was younger and had wavier hair. As her hair has become more dense I’ve found Jojoba Oil or this Moroccan Oil works best. Read labels carefully when choosing oil! A lot of times there can be hidden ingredients. We try to buy 100% pure oil. Step 6 Cream: There are so many different types of creams or curl finishing products you can use! I’d say experiment and find what works best for your hair type. One of our favorites is SheaMoisture Coconut & Hibiscus Curling Gel Souffle . It works wonderfully for us. The gel doesn’t leave Izzy’s hair feeling too crunchy or wet looking. It defines the curls and holds the curl the whole day. We also love DevaCurl’s Ultimate Defining Gel and Coconut Supercream. If her hair is dry I’ll ditch the gels and use the supercream instead. Then we let our daughter’s hair air dry. This can take a few hours so we try to give her a bath earlier in the day. That way she won’t go to bed with a wet head of hair. 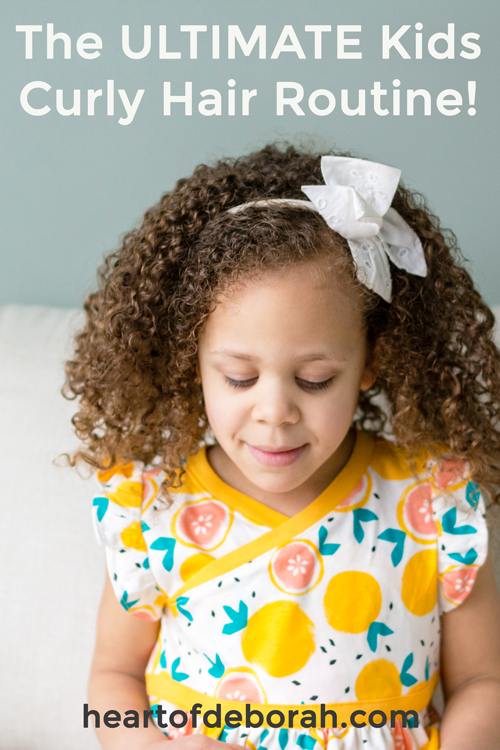 She loves wearing her hair down naturally so this kid’s curly hair routine works wonderfully for that. To redefine second day natural hair, we use a spray bottle with water and more conditioner or super cream to shape the curls. Other times we use protective styling like banding. It is super easy and it looks adorable. We leave the banding in for one to two days. When we take it out her curls are lengthened (see photo with orange dress). Though you lose some curl definition you don’t have as much curl shrinkage. 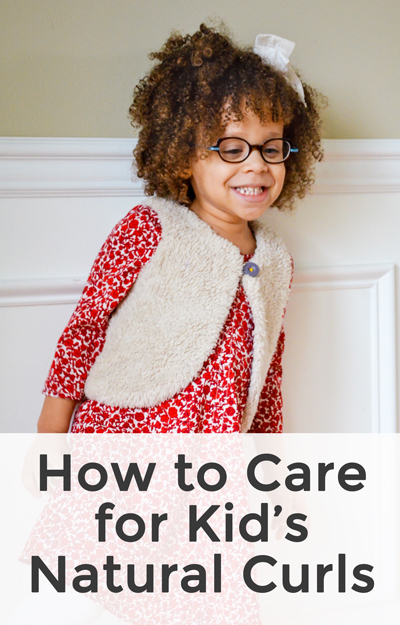 Do you have a child with curly hair? What are your favorite products and routines? 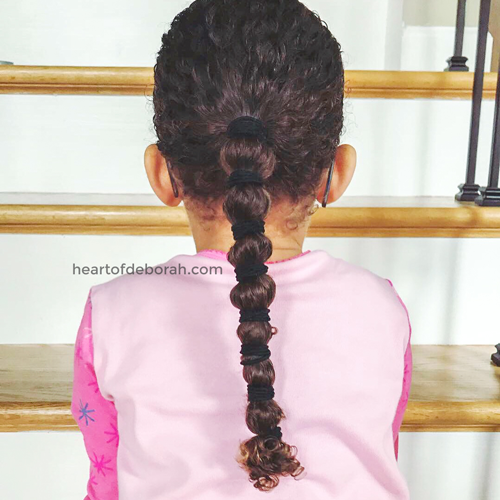 I’d love to hear your experiences in the comments belowWhat is your kid’s curly hair routine? I have 3 children and one of them has very curly hair as well. I also find that it only truly looks great after a bath. I don’t spend a big priority on making it look nice unless its important (eg. an important event or photo) since I find that as she gets playing it just gets very frizzy. I also need to use only unscented products for my family due to my own allergies so it gets tricky to find anything to use. So far we just manage it by washing once a week and when we do, we comb it out when conditioner is in it. In between we barely brush it- just enough to gently put it into a ponytail or something if needed. Its really only possible to brush it when its got conditioner in it. 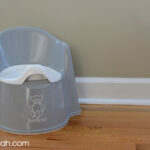 Do you know of anything unscented that works that is also safe to use? I use Giovanni Natural Mousse Air-Turbo Charged for my own hair. I believe it is unscented. It is a very light mousse because my hair is somewhat thin. I’m not sure how it would work on thicker curls. Also, SheaMoisture makes a fragrance free shampoo. The curl souffle from SheaMoisture doesn’t list “fragrance” as an ingredient, but it does have a scent from natural oils/extracts. I hope this somewhat helps! Hi! I have a 2.5 year old daughter and she has curly hair very similar to your daughter’s. I have actually just discovered Melaleuca’s line of products to work very well and they don’t have any hidden chemicals in them either. We use Affinia Ultra Moisturizing shampoo, which is sulfate free, and it really helps to soften the curls and keep them from getting frizzy. Then we use conditioner but don’t rinse it out. I leave that in her hair for a few minutes, then add argan oil to her hair before combing it out. Laura, this is really the info I am looking for! 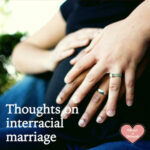 My two daughters are also biracial. I call them rainbow babies. So far I honestly have not ever brushed my oldest daughter’s hair. Only finger brush it in the morning. I am a bit lost at what to do, since I have long and absolutely straight hair myself. And her dad has dreadlocks that he tends after, but not much help form his routine. I have been hesitant to start using product at this stage – she is 22 months. At what age did you start using product in your daughter’s hair routine? I didn’t start using all these products until maybe 3? I definitely used lots of conditioner even when she was young, but I didn’t start truly styling until later. 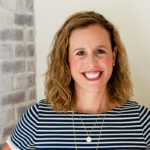 Though I know many moms who style right away, it’s up to you! Love these tips!!! I will definitely save for when my baby is older (not quite born yet!!). I’ve been doing a lot of research on what to do as it is really impt to me that her hair looks well cared for, especially since it’s so different than mine. 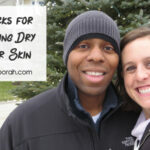 I am white as well and my husband is black. My youngest daughter is 4 and has very curly hair. We swim daily, do you have any ideas on keeping it soft during swim season? Swimming is tough on curly hair! We try to use a leave in conditioner or mask before we swim. It helps coat the hair. I’ve also heard olive oil, but I’ve never personally tried it. We also got my daughter a swim cap this year and she actually wants it! I think it keeps the hair out of her face when she swims (and we don’t swim at a public pool so she doesn’t seem to mind). Hope this helps! Do you use the deva curl original or the decedance? I use decadence, but it depends on your hair! The original wasn’t thick enough for my daughter’s texture. Thank you for the tips! I have wavy/curly hair but figuring out my 2.5 year old son’s biracial curls has definitely been an ongoing process. We already put into practice some of these methods but are still struggling, especially with one area of very tightly coiled hair that always ends up knotty and matted by the day after his hair routine. Looking forward to adding in some of these other ideas/products!